It took the BBC all week to master the correct pronunciation of L'Aquila, the Italian city devastated by the earthquake. Broadcasters as famous as John Humphrys and Fiona Bruce started out by calling it la-QUEE-la, but more surprisingly, even reporters on the spot got it wrong. Duncan Kennedy, who was described by the corporation as its Rome correspondent, also called it la-QUEE-la, while George Alagiah, who had hastened to Italy to address us from among the ruins, gave it the more rarefied pronunciation of la-KEE-la, as if it were a Mexican liqueur. It should, of course, be pronounced LA-qui-la (with the stress on the first syllable). The BBC's pronunciation research unit is sadly not succeeding in its proclaimed purpose "to ensure that pronunciations used on the BBC are accurate and consistent". 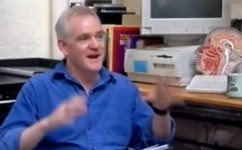 The fault lies not with the BBC Pronunciation Unit, but with newsreaders and reporters who do not bother to consult the database the Unit provides. The Pron Unit will certainly have the correct pronunciation on file, and as far as I am aware always responds promptly and accurately to enquiries. The name L’Aquila is not in British pronunciation dictionaries (perhaps it ought to be), but it is in the Duden Aussprachewörterbuch, as ˈlaːku̯ila. Once upon a time any educated person had some knowledge of Latin. Not any more. But classicists will tell you that the Latin word for ‘eagle’, the origin of this name, is ăquĭla (with a short i). As readers of this blog will know by now, a Latin word in which the penultimate vowel is short and not followed by a consonant cluster has its stress on the antepenultimate. This Latin rule still works for Italian, as long as you know the Latin vowel quantity, lost as such in Italian. And by the way, the Latin word for ‘songs’ is carmĭna, so this word too was/is stressed on the antepenultimate. As far as Orff’s Carmina Burana goes, insisting on this stressing seems to be becoming a lost cause. I was wondering whether this is just because it is a word she had not heard said often (though in this same meeting I had used it several times), or whether this is a recognized US variant (not in LPD). I share Martin’s bemusement. I have never heard anything but initial stress for this word, ˈɒbstruənt. Classicists will know that the Latin etymon has a short vowel, obstrŭ-ō, -ent-, and therefore initial stress. Words with other vowel stems plus -ant ~ -ent include brilliant, radiant, valiant, variant, gradient, lenient, prurient (all antepenultimate), but on the other hand compliant and defiant (penultimate, because of the verbs comply and defy). A word I don’t think I’ve ever encountered outside early nineteenth century poetry is reboant. The OED says it has initial stress, ˈrebəʊənt. Merriam-Webster agrees (sound clip). María Alicia Maldonado wrote to say that she had come across a textbook in which English /h/ was described as a “voiceless glottal approximant”. Given that in LPD I classify it as a “voiceless glottal fricative”, she wonders which is right. First, I am not alone in classifying [h] as a fricative. That is how it is categorized on the IPA Chart; that is how Cruttenden, Roach, Collins, Ashby & Maidment and other respected writers on English phonetics categorize it. 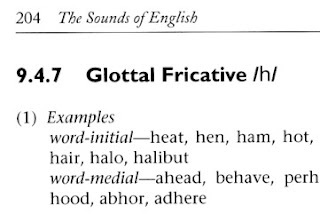 Secondly, however, it is clear that [h] is different from the other English voiceless fricatives [f, θ, s, ʃ], in that it does not involve a constriction within the mouth cavity. 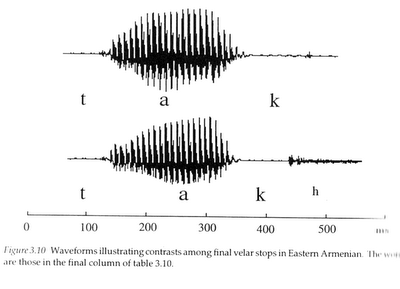 Conventionally we classify it as a glottal fricative, but the constriction giving rise to the turbulence that we hear as friction may be not so much located at the glottis itself as distributed throughout the whole of the upper vocal tract. Forms of h, ɦ in which a turbulent airstream is produced at the glottis are also sometimes classed as fricatives […], but it is more appropriate to consider them in the chapter on vowels. At the end of the vowels chapter they mention the possible description of [h] as the voiceless counterpart of the vowel that follows. In such cases it is more appropriate to regard h and ɦ as segments that have only a laryngeal specification, and are unmarked for all other features. But in some languages, including Hebrew and Arabic, a glottal constriction is observable during the production of these sounds. One problem with classifying [h] as an approximant is that voiceless approximants are by definition inaudible. (Or by one definition, at least. Approximants used to be known as “frictionless continuants”.) If there’s no friction and no voicing, there’s nothing to hear. Anything you can hear during a voiceless [h] must be some sort of weak friction, resulting from some sort of weak turbulence, which means that [h] is some sort of weak fricative — but still a fricative. The English /h/ phoneme does not behave like a vowel. We say a house, not *an house. We say ðə house, not ði house. 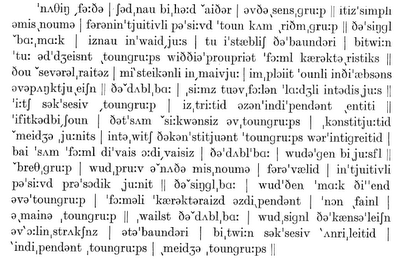 You get a linking r in you’re out, but not in your house — except among non-standard speakers who drop h.
The tradition in generative phonology is to class [h] as a glide, along with [j] and [w]. That’s fine phonologically, but not very helpful phonetically. For practical teaching, it’s convenient to call [h] a fricative. But you do have to emphasize that there is no friction at the uvular or velar place (of the sort you get in [x] and [χ]). Many EFL learners can be helped by thinking of [h] as just a voiceless onset to the following vowel. 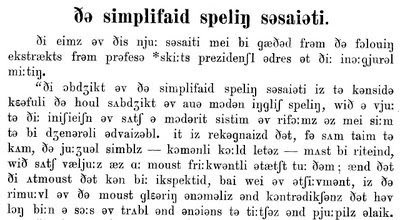 Advanced students can be asked to write an essay on the problem of defining the terms fricative and approximant.